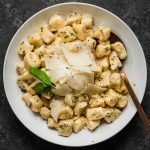 An easy homemade gnocchi recipe using leftover mashed potatoes. Don’t forget to read the recipe notes before you start – they’ll help you make the best gnocchi possible! Add mashed potatoes, egg, and a pinch of salt to a large mixing bowl. Add 1/4 cup of flour to the bowl and gently stir to combine. The amount of flour you need will vary based on your mashed potato recipe – I find I usually need around 1 cup to get a gnocchi consistency I like. I recommend adding flour 1/4 cup at a time until the dough feels right. You can mix the first bit of flour in with a spoon or spatula, but after that it’s helpful to use your hands to finish mixing. When the dough is ready, it should be soft and light, but not sticky. Avoid overworking the dough – this can cause chewy, gummy gnocchi. Lightly flour a large cutting board and a sheet pan or large plate. Use a knife to divide gnocchi dough into 4 or 5 sections. Place one section of dough on the cutting board and use your hands to gently roll it into a long rope, about 1/2″ thick. If the dough gets sticky as you roll it, dust it with some extra flour. Use a knife to cut the rope of dough into 1/2″ pieces – these are your gnocchi! Transfer the cut gnocchi to your lightly floured sheet pan and repeat the rolling and cutting process with the remaining dough. If you’d like, you can roll each gnocco across a gnocchi board or the tines of a fork to form ridges (see recipe notes). Bring a large pot of water to a boil and add a generous pinch or two of salt. Carefully add gnocchi to boiling water give them a gentle stir. Cook for 2-3 minutes until gnocchi float to the top of the water. Drain and toss with your favorite sauce. For the sauce: For these photos, I melted 4 Tbsp. of unsalted butter in a skillet with fresh rosemary, basil, salt, and pepper, then tossed it with the gnocchi and a splash of the gnocchi’s cooking liquid. The gnocchi are topped with shaved parmesan, an extra dusting of fresh ground black pepper, and fresh basil. I also love these gnocchi with tomato sauce, browned butter and sage, garlic alfredo, or my parmesan spinach gnocchi recipe! Work the potatoes as little as possible. Overmixed/overworked potatoes can get gummy and gluey, resulting in dense gnocchi, so fold things together as gently as possible. When the dough has enough flour worked in, it should feel soft but not sticky and relatively light. If the dough starts to feel sticky as you’re rolling it out, dust it with a bit more flour. Start with good mashed potatoes. If your leftover mashed potatoes are dense or gummy, your gnocchi will be, too. I find I prefer these gnocchi made with light and fluffy mashed potatoes (rather than thick, runnier potatoes). For tips on how to make the best mashed potatoes, start with Mashed Potatoes 101 and my Ultimate Mashed Potatoes recipe. Leave out or reduce the egg if you like – the egg can make your gnocchi a little denser, so feel free to adjust if you’re worried about your gnocchi being too heavy. I like using a whole egg because it’s just easier (I hate having a leftover half-egg to deal with) but you can reduce the egg. Use just an egg yolk, or whisk an egg together and add just half to the gnocchi. You can leave the egg out entirely, but I find it’s a useful binding agent that helps the dough come together with less kneading. No egg also means you’ll need less flour, so keep an eye on your dough. Authentic Italian Gnocchi are exceptionally light and airy, usually made with riced potatoes. Because we’re starting with prepared mashed potatoes, these gnocchi may naturally be a bit heavier (although I find that with a bit of practice, these gnocchi are still quite light). If you’re looking for an authentic, just-like-Grandma-made Italian gnocchi recipe, try something like this. But if you just have some leftover mashed potatoes you want to repurpose, I think you’ll be more than happy with the ease and texture of this recipe. To freeze these gnocchi, line a baking sheet with a nonstick baking mat (you could also use waxed paper) and lay gnocchi out in a single layer. Freeze for 2-3 hours, then throw the frozen gnocchi in an airtight container (I use my reusable Stasher Bag!) for up to 3 months. To cook, drop frozen gnocchi directly into boiling water and cook for 4-5 minutes until gnocchi float to the top of the water.